Today has been such a crazy day! I went to Home Depot on Saturday with my Husband and as he was looking around for lights for his garage, I decided to look at paint, just because I was bored. Next thing you know I bought a gallon of a light green paint and told my Husband it’s for the kitchen. I have a yellow kitchen and I am just so sick of the color that I thought we should change it up! Next thing I know at 6am, my Husband was painting away!! About 5 hours later it was done! I spent my day cleaning cupboards, counters, re-arranging and enjoying my green kitchen! It’s so much better than clam chowder yellow! See that’s what my Husband gets for taking me to Home Depot! Now I just need a new refrigerator I saw a really, really, really nice one by LG. I don’t know much about LG appliances but I do know this refrigerator has everything I want, plus it’s a pretty silver! My Husband better not take me to HD anymore!! Today’s recipe is so simple, but cute, that I thought I should share it with you! 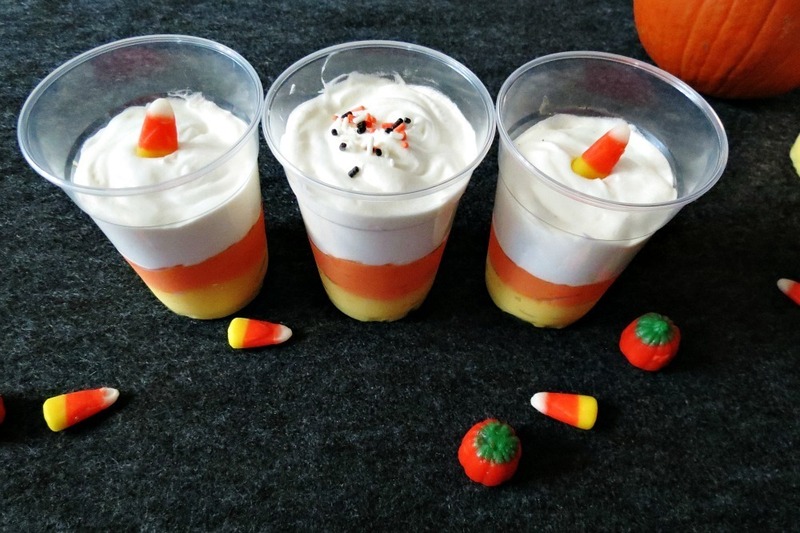 This is my Candy Corn Vanilla Pudding Cups. I love candy corn! I don’t eat it much, but I think there just the cutest little candies!! There is something about the colors of yellow, orange and white together packaged up in a small sweet package that calls me.! This recipe is so easy, so easy that anyone can make these little guys! All I did was use one package of Jello Sugar Free Instant Vanilla Pudding, added some food color and topped it with Cool Whip. How simple is that? I think this is a great little treat for kids or Husbands, and only comes in at just 100 calories, so it’s guilt-free too! 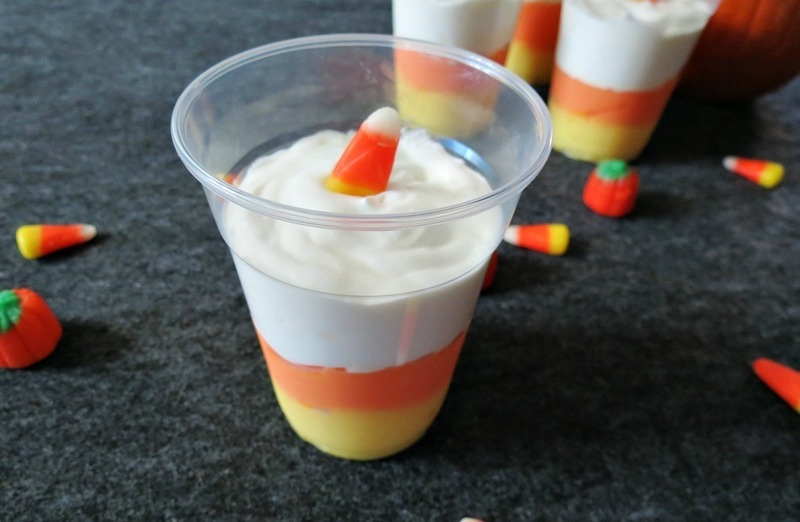 Oddly enough, my Husband with the major sweet tooth doesn’t like candy corn, but he did like the pudding! I decided to top the pudding with a candy corn and sprinkles to give it a little more pizzazz. I also decided for easy clean-up to put the pudding in little plastics cups. I think that makes it easier for kids, plus you can see through the cups! After all whats the point of making candy corn coloring if you can’t see it? Jello vanilla pudding, colored to look like candy corn and topped with whip cream and sprinkles. In two medium bowl, split the vanilla pudding dry mix between them (16 grams of dry mix in each bowl). Add one cup of milk in one bowl, and whisk until thick about 2 minutes. To make yellow color, add 2 drops of yellow food coloring, mix until incorporated. Set bowl aside. In other bowl with pudding mix, add 1 cup milk and whisk until thick, about 2 minutes. To make orange color, add 1 drop of red food coloring and two drops of yellow and mix until desired color is achieved. In four small cups, evenly divide the yellow pudding between them. Evenly divide the orange pudding on top of the yellow pudding. Top orange pudding with Cool Whip. Refrigerate until ready to eat. 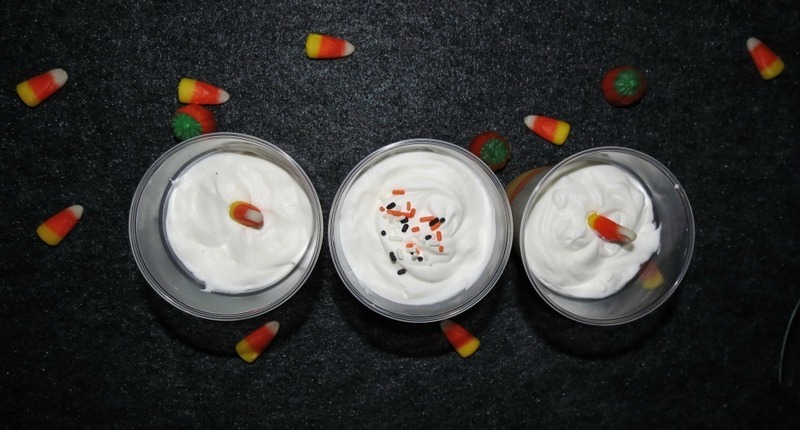 Optional toppings, candy corns or candy sprinkles. 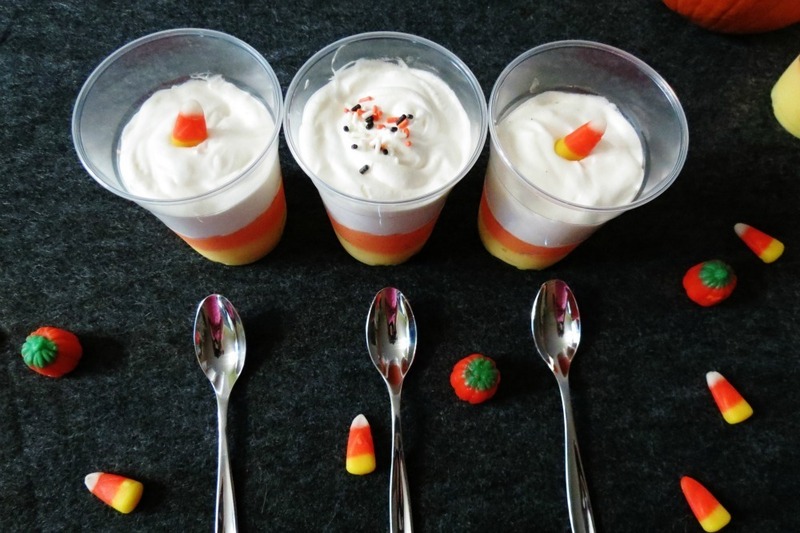 I know I am so not the best person when it comes to decorating or working with cream, but I don’t think I did to bad with these candy corn pudding cups. 🙂 Sometimes simple is so nice! 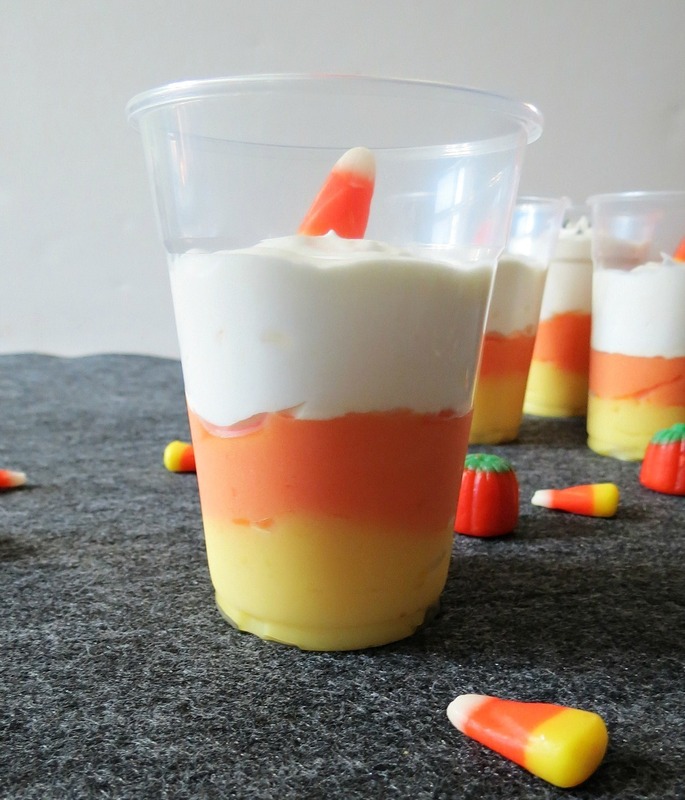 I love these fun candy corn cups! Addictive and yet…no-guilt. What could be better! Oh I am food shopping tonight and I am adding this to my list of things to pick up! Have to do this for Halloween!! That’s actually such a great idea!! Love it!